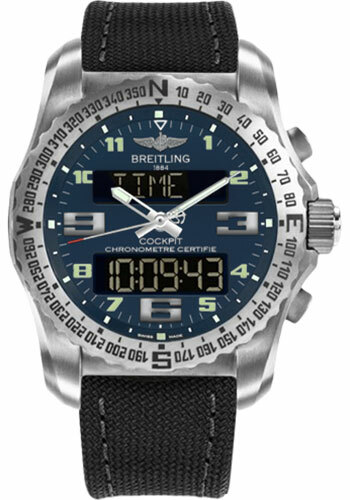 46.00 mm titanium case, back with screws, non screw-locked crown with two gaskets and integrated push piece, bidirectional ratcheted rotating bezel windrose, cambered sapphire crystal with glareproof treatment on both sides, Air Force blue dial, thermocompensated SuperQuartz electronic Breitling B50 movement with rechargeable battery, chronograph function, countcown countup clock, flight time chronograph, electronic tachometer, countdown, 2nd timezone, alarms, analog and 12/24 hr LCD digital display, backlighting, and EOL indicator, anthracite military strap with tang-type buckle. Water resistant to 100 m (330 ft). 46.00 mm titanium case, back with screws, non screw-locked crown with two gaskets and integrated push piece, bidirectional ratcheted rotating bezel windrose, cambered sapphire crystal with glareproof treatment on both sides, Volcano black dial, thermocompensated SuperQuartz electronic Breitling B50 movement with rechargeable battery, chronograph function, countcown countup clock, flight time chronograph, electronic tachometer, countdown, 2nd timezone, alarms, analog and 12/24 hr LCD digital display, backlighting, and EOL indicator, anthracite military strap with tang-type buckle. Water resistant to 100 m (330 ft).